Sausalito (2012) – Aboard the Amakua there is camaraderie where once there was stress. 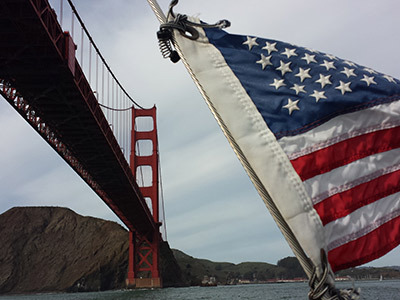 Veterans of many conflicts are finding peace and tranquility on the healing waters of the San Francisco Bay. On all the other boats out there, folks already know about the feeling of freedom on the water, and how being active in nature can help us relax. It’s no surprise then that our wounded warriors are turning to sailing as a way to reclaim their peace of mind. A new non-profit group is doing just that. Transformational Sailing was created to help Veterans with post-traumatic stress disorder (PTSD) and a variety of other issues, become more effective in group settings that far too often, make them feel vulnerable. “This was my first time out in public in two years and you know, I really didn’t think I needed something like this,” said Navy Vet Rob Geidl, “but it was a crystal of thought that I can hold onto. It soothed me as I am going through treatment. It gave me hope that I can be involved in something as peaceful as sailing.” Veterans of all ages and tours of duty know how it feels to flirt with danger in a war zone. Most need to relearn how to just relax and enjoy. “We’ve met Vets who have gone from feeling withdrawn to feeling calm and enjoying themselves in a relaxed group setting aboard our boats,” said Tim Blair, founder and director of Transformational Sailing. A lifetime sailor, Blair grew up with the Sea Scouts and knows about sharing the experience. He’s sailed on the Bay for the past 30 years and you can usually find him out there on any given Sunday with eight or ten guests – mostly Vets and their families. “We’re all in the same boat – literally! These guys have to learn how to work together to keep us moving,” Blair adds. The healing comes from succeeding in the often-stressful circumstances when the combination of wind and sea conditions can test ones capacity. Otherwise, it’s quite relaxing. The program is currently raising funds to help maintain their primary boat, a classic 42-foot Sparkmann and Stephens designed fiberglass sloop. The boat is on loan to the program by Blair and he has plans to get at least two boats out there every weekend as soon as funds are raised. 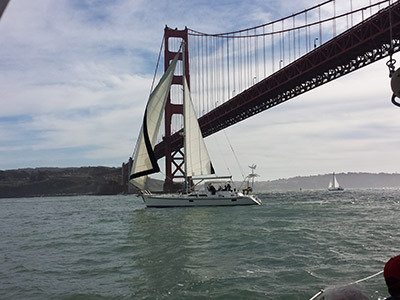 Working together with Sonoma-based Vet Connect in Santa Rosa (Chapter 78), Transformational Sailing offers sailing excursions to anyone who may be suffering, either physically or emotionally or who might benefit from time spent on the water. 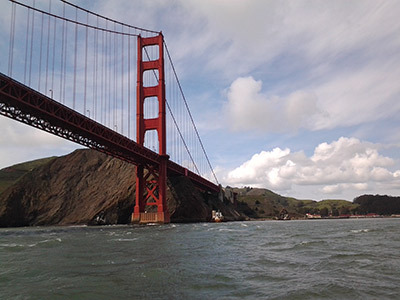 The Transformational Sailing Program serves people who are recovering their health and well being by providing supportive and life-affirming sailing experiences on San Francisco Bay. People challenged with PTSD, cancer or other health crises often lose out on the simple pleasures of life, such as a day of sailing on the Bay. Their mission is to offer these individuals a regenerative experience of joy and camaraderie in this natural healing environment of wind, sea and sky. Guest sailors gain knowledge and acquire skills while taking in the splendor of the Bay and making new friends and developing confidence and self-esteem through sailing team-building and hands-on instruction.